There are people that are extreme nature lovers, to an extent that they want to feel the presence of trees in their houses and offices. It isn’t strange to find out that people love different types of trees, and at times the trees they love are out of bounds. For people that love beauty with mystery, they will go for wisteria tree. This is a tree that is found in China, Japan and also in Korea, which a species of flowering plants in the legume family. This means wisteria artificial tree isn’t poisonous; however, it takes more than 15 years to grow. This is one of the reasons why people will go for the artificial form, to avoid the wait and also decorate their houses and offices. 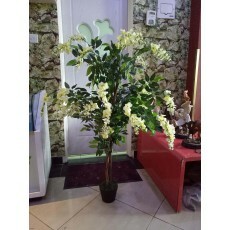 The artificial plants that we sell are highly affordable, and to extend our hospitality, we transport selected items. We do operate on a 24/7 basis, both online and physical. We are the best choice when it comes to the most beautiful, colorful, classy and trendy items.